It's one thing finding cheap Les Paul guitars, another finding LPs that don't sound cheap. Time and time again I come across a review or forum post stating how ridiculous the price gap is between the $2000+ Gibsons and the sub-$300 "copies". In the guitar world, the old rule of "you get what you pay for", although still relevant, is becoming less and less an indicator of quality, as you'll see and hear. If you're looking for a Les Paul style guitar on a budget, there has never been a better time. We've whittled it down to four solid picks based on the opinions of both new and experienced players. Scale Length 24.75" 24.75" 24.75"
Modified to meet the requirements of the modern player, with hot, metal-ready humbuckers, which adds a whole new dimension to your tonal options not offered by the more traditional variants. The thinner neck and lighter body doesn't seem to take away the depth and richness LP lovers demand, meaning those who prefer a less bulky profile can still enjoy the meaty tones. The coil tap (simply click up the volume knob) allows you to effectively switch the humbuckers into single coil mode for a skinnier, noise-free Strat-like chime and twang. Users are impressed by the stock ESP pickups - noiseless, punchy, well balanced and not too dark or muddy. In fact they're a little brighter and snappier than your typical Les Paul clone. The EC-256 stands out from others on this page in that there's little to no expressed desire from users to change the stock pickups. This is reflected in the highest rating of the four. Extra jumbo frets give you that scalloped neck feel and, coupled with the slim U neck profile, puts this axe confidently in shredding territory, confirming it as one of the most versatile cheap Les Paul style guitars available. 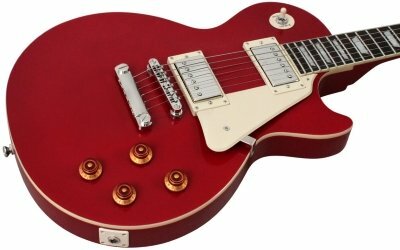 For many budget musicians, the Les Paul Standard is a crucial step up in quality from the even more modestly priced LP100 and Special II models offered by Epiphone. The main differences are an arched (as opposed to flat) top, set neck and solid mahogany body (that's one piece as opposed to several pieces glued together). The result is a look, feel and tone much closer to the Gibson Standard. The general consensus is, if you were considering either the LP100 or Special, it's worth saving the extra 150 or so bucks for stronger construction, more sustain, harmonic response and an overall meatier Les Paul crunch. The Standard Plus-Top (add about $50) gives you the option of a flame maple top, although not quite as detailed as the impeccably hand finished USA Gibsons. The Standard delivers that rich, warm and gutsy tone all Les Paul players fell in love with. When the inevitable comparison is made between the Epiphone and Gibson Standard, the Epi perhaps lacks some mid-range depth and bite, due to cheaper materials, electronics and stock pickups. But the fact that it is six times cheaper than the Gibbo quickly puts things into perspective. You can always upgrade the pickups and pots. The solid foundations are there. Some players (and not just inexperienced players) can't even tell the difference or simply think the two sound different, rather than one sounding "better" or "worse". This ultimately boils down to your personal judgement. Hailing from Britain and the family run John Hornby Skewes factory, the Vintage V100 has become one of the most respected, authentic Les Paul copies available. Residents outside the UK should be able to get hold of a V100 through Ebay or local stores/classifieds. Users note how versatile the V100 is, with that fat, deep and gutsy LP warmth as the foundation for many different styles of playing. The tone knobs are surprisingly responsive and sweeping for a guitar of this price, without muddying or muffling the tone when things are pulled back. The set mahogany neck and thick body (only a couple of pounds lighter than the Gibson Standard) help towards producing excellent sustain and harmonic response. The V100 offers everything players look and listen for in a traditional Les Paul, at a fraction of the cost, and the quality has surprised even the most experienced of players.